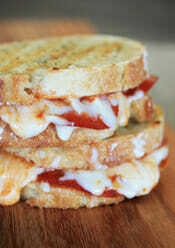 Grilled cheese and pizza hitch up in this easy (and yummy!) dinner idea. Lightly butter one side of each slice of bread, or brush lightly with olive oil. Sprinkle garlic bread seasoning on each slice and gently pat on with clean hands. Turn slices of bread over. Spread pizza sauce on each slice and sprinkle with cheese. Place pepperoni slices on one of the sandwich halves and then place the two pieces of bread together. Grill on a panini press or hot skillet, or place under a broiler in the oven, flipping once, until both sides of bread are toasted and golden brown and cheese is melted. Cool for 3-5 minutes before slicing in half and serve.